Namchi, means sky high, nestled among the hills at an elevation of 5500 ft., commands panoramic view of the snow capped mountains and vast stretches of valley. it is also the HQ of the south district. The area is fast developing into a tourist destination with its immense potential for all round tourist activities. It is about 78 kms. from Gangtok and 100 kms. from Siliguri. Above Damthang, overlooking South District Headquarter town Namtse, there is a small flat stretch of land at an altitude of 8530 ft.,surrounded by lush green ancient forest which is popularly known as the Tendong Hill. Historically, this has been a place of recluse for Buddhist Lamas who spend years in meditation amidst the silent scenic grandeur. The view from the top of the Tendong Hill is something to be cherished and enjoyed as it spans across plains of Bengal to the majestic heights of the Himalayan Ranges. 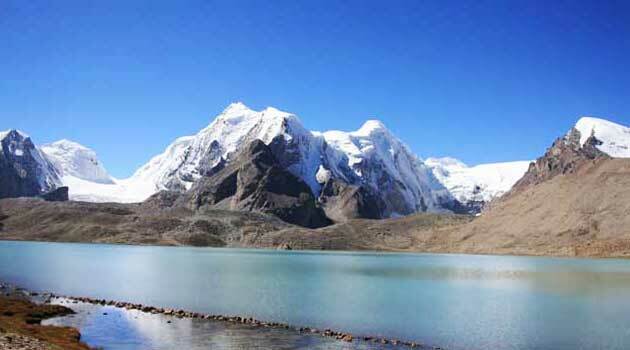 One can also proceed to Namtse by trekking via Tendong Hill following the traditional route used in the old days. Such trekking is also possible throughout the year except during monsoons, that is if one is scared of ubiquitous leaches. At the base of Maenam Hill is Ravangla, a small township and transit to various tourist destinations in South Sikkim and West Sikkim . It is also an upcoming tourist spot, and transit point for trekkers to Maenam Hill and Borong. There are accommodation facilities and numerous short nature trails. A trek down to the sacred cave "Shar Chok Bephu", one of the holiest caves in Sikkim. Maenam towers above Tendong Hill on the other side overlooking the Ravangla Bazar settlement. situated at an altitude of 10,300 ft., the scenic view from this height is, perhaps, unmatched in this part of the world. The trek from Maenam from Ravangla takes about 4 hrs. and from Maenam Hill-Top one has the option to take the gentle trek to Borong village . Facing the snow-capped mountains is Borong motorable from Ravangla or a trek via Maenam. A picturesque village with beautiful landscape and magnificent view is also host to the hot spring "Borong Tsa-Chu". The trek trail, originating from Namchi or Damthang to Tendong-Ravangla-Maenam-Borong (5 to 6 days) is one of the most interesting trials scaling the hill tops along the route. 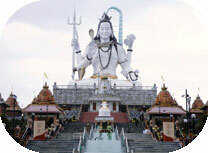 A unique pilgrim centre with a 108 feet tall statue of Lord Shiva , this pilgrim centre also has replicas of the twelve Jyotirlingas to offer one platform for Shiva devotees. Sikkim has created history by bringing the four Dhams under one roof at Solophok, Namchi, South Sikkim. The four most revered Dhams of the Hindus Jagannath, Dwarika, Rameshawaram, Badrinath has been replicated in this fantastic complex to benefit the devotees who will visit this place. 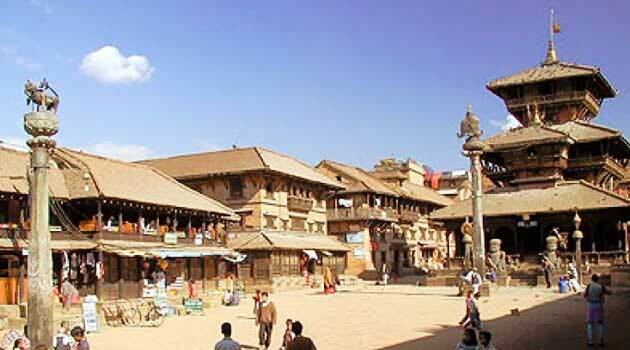 This place is regarded as sacred as its meant for Hindu pilgrims where the pujas and ceremonies are performed. 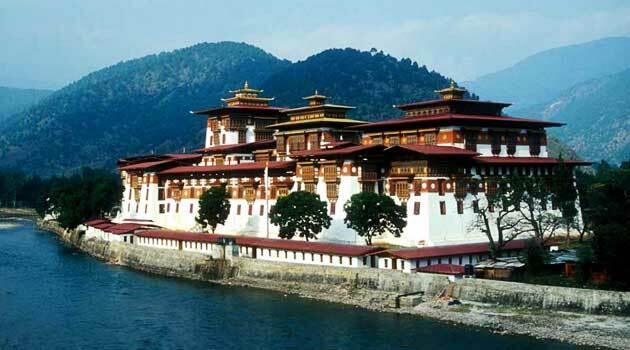 Very soon this place will be counted among one of the ideal point for tourist destination, since the place is coming out with a big statue of Lord Shiva as equally big of Guru Padmasambhava of Samdruptse Hill. This place will definitely fascinated the tourist as these two magnificent statues would be facing each other on two top of the hills. 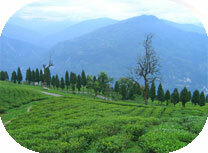 Temi Tea Garden is the only Tea Estate in the state of Sikkim. The garden is just 18 km from Ravangla and can be visited on a day tour from Ravangla. The garden is spread on a slope below Tendong along the highway to West Sikkim. Temi Tea Garden was established in 1969. The total area of the Temi Tea garden is approximately 435 acres. The garden employs about 450 people and produces 100 matric ton of orthodox tea annually. The garden produces some of the best teas in the world. The original tea saplings were brought from Darjeeling, and the produce of the garden are not very different from what one can expect from the gardens of Darjeeling hills. The garden offers beautiful natural views. The picturesque view of tea plucking can be seen here during the plucking season. The factory can be visited to have an interesting lesson on tea processing. 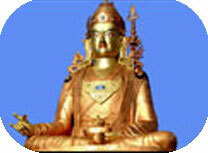 Samdruptse lies close to Namchi in the South Sikkim region. 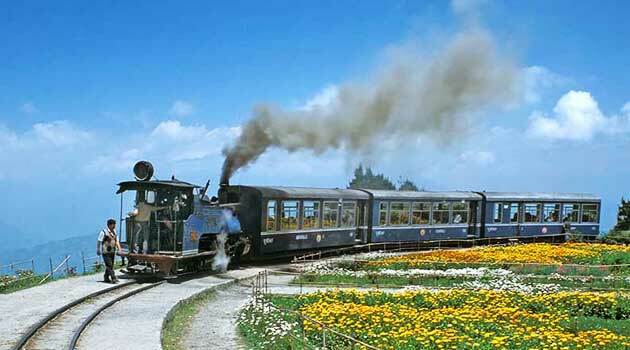 It is at about 75 km from Gangtok. The hill has gained popularity for the presence of a gigantic statue of Guru Padmasambhava also known as Guru Rinpoche - the patron saint of Sikkim who is believed to have blessed the land of Sikkim. The statue is about 135 feet tall and is the tallest figurine of his in the world. The foundation stone for the statue was laid by Dalai Lama in the year 1997 and construction of the statue was completed in about three years of time. The construction was sponsored by the Sikkim State Government.